Led by the Chair in Nature-Inspired Sensing and Flow Control for Sustainable Transport, Professor Christoph Bruecker, City's research demonstrates the way in which peregrine falcons perform complex maneuvers to attack their prey. Through a soon-to-be published article in Communications Biology, researchers from the Department of Mechanical Engineering & Aeronautics at City, University of London will demonstrate the physical mechanism employed by peregrine falcons to perform highly complex flight maneuvers at full speed during swoops from high altitudes to attack their prey. The article's authors are led by Research Chair in Nature-Inspired Sensing and Flow Control for Sustainable Transport, Professor Christoph Bruecker. Professor Bruecker is also City's BAE Systems Sir Richard Olver Chair in Aeronautical Engineering. Experimental studies in City's wind tunnels combined with numerical flow simulations using computational fluid dynamics (CFD) show that the wing shape and body configuration of the peregrine falcon produce several vortices which help to achieve flight stability and control during their complex maneuvers. 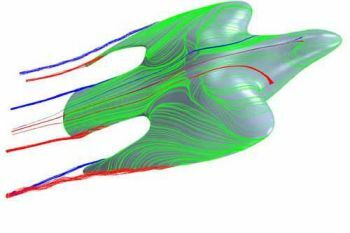 The image at right shows the evolution and passage of the vortical structures over the bird from the CFD simulation. The path of these vortices can be tracked by following each of the corresponding streamlines. The forward swept wing segments also function to precondition the flow towards the tail such that the tail feathers have full pitch control.